Being a first time mother, I was always jittery about the products I chose for my baby. Newborns have very sensitive skin and it is common to hear of harmful chemicals being detected in babycare products ever so often. I have always been very conscious while buying skincare products and choosing the most appropriate ones for my baby. Therefore, it was natural for me to zoom in and read fine print across labels of some of the best soaps for babies. However, that left me more confused than before. As my daughter was the first child in the family after a long time, the advice were pouring in even before she was born. I never knew that choosing the right baby soap would make me so worrisome. Especially with commercials and the Internet full of stories on how even baby products are loaded with carcinogenic chemicals; I was biting my nails off! So, I decided to start trying a few brands of soaps for my baby after a deep research on it and also not sticking to one brand for more than one month. After experimenting with some of them, I finalized few at the top of the chart in terms of several parameters which are sensitive towards baby’s skin. If you too are a new mom, you need not do what I did. I am going to make this a lot easier for you. Here, I am sharing some simple tips about picking the right baby soap for your bundle. I have also made a list of the top 5 soaps that you can choose from based on what your baby needs. Hope that helps. Choose soap, which is extremely gentle and mild on the baby’s skin. Soaps that have extra lather should rather be avoided completely. Your baby’s skin is very different from yours. So, don’t get tempted by the commercials that show oodles of lather and how much fun it can be to blow bubbles. If you want a scented soap, choose one, which has a very mild fragrance. What I have noticed is that children are very sensitive to strong smells. They often find it quite irritable. Often strong chemicals are used to lend a strong fragrance to soaps. These can lead to harmful reactions on the baby’s skin. Therefore, it is best to opt for a soap which is not too strong to smell. If possible, look up the ingredients that are used in a soap. If you find that something is even mildly hypoallergenic, make sure you avoid it. It can lead to rashes or other allergic reactions. Natural ingredients are used in some of the best soaps. If the soap contains milk, almond oil or coconut oil, then it can work wonderfully when it comes to moisturizing the baby’s skin. Bubble bath products are a complete no. If you choose to bathe your baby in a bathtub, use essential oils such as lavender oil instead. When we were growing up there was just the Johnson’s Baby Soap Bar that came across as the most reliable name and rightly so. However, I was very excited to explore different soaps from so many choices I had as a mom of today. Honestly, I was quite surprised to see how much variety is available with baby soaps now a day. Whenever I buy baby soap, I make it a point to go through the list of ingredients. This soap is enriched with coconut oil and palm oil. That tells me that it is safe for my baby. These oils also nourish baby’s skin and keep it hydrated. 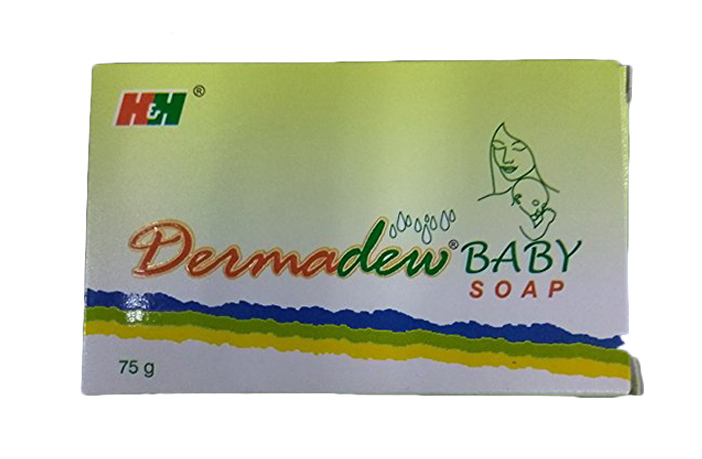 The Dermadew baby soap is sold on prescription for the most part. However, it is also available online. It is highly recommended when children have dry skin, rash, or any other allergy or irritation. The soap is extremely gentle and also aids skin repair because of the proteins it is fortified with. Most of its other ingredients, are also plant based. You will see pea extract, mushroom extract, aloe vera, kokum butter, shea proteins and others among the list of ingredients. So you know that it is suitable for your baby’s sensitive skin. 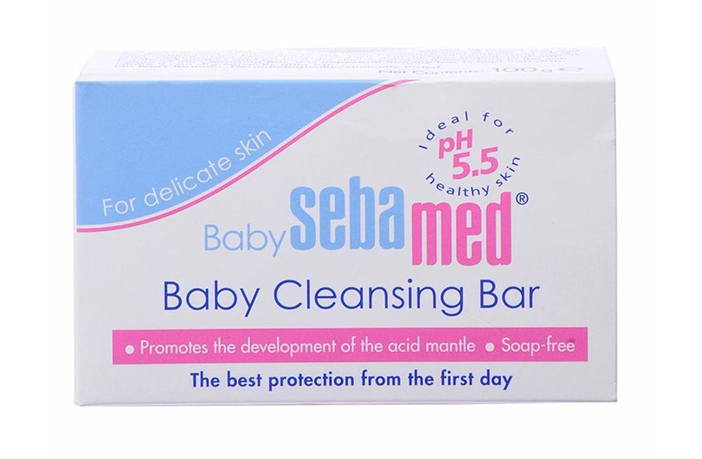 This soap is normally recommended for babies with extremely sensitive skin. However, I used it for my little one and myself as well even though there were no skin issues. It has also been around for decades now. Heinz Maurer introduced it in the year of 1957. It is a German brand whose claim to fame was that it sold a soap, without any soap in it. It is made from a great combination of plant-based ingredients and also contains wheat germ oil, which is very good for baby skin. The soap is non-allergic and offers a pH balance of 5.5. This means that it is actually quite gentle and protects the texture of your baby’s skin. Sebamed comes fortified with vitamins and several amino acids and is therefore, apt to facilitate repair of damaged skin helping it stay soft and supple. If you are a fan of eco-friendly products, then this will appeal to you a lot more as this soap is 100% biodegradable. It is completely free from any phthalates, TFMs and other chemicals; thus being completely eco-friendly. The moment you see this soap, you get the feeling it must be good for your child. It has a very earthy quality and comes wrapped in a bright piece of cloth. If organic products appeal to you, then you will absolutely love this one. There are zero synthetic elements in this soap. This is why it is pH neutral. As a result, the baby’s skin also remains balanced and protected. All the oils that are used in the soap are cold pressed. The soap contains only organic oils including corn oil, neem oil, olive oil, coconut oil and castor oil. Among the other ingredients are essential oil extracts, shea butter, calendula extract and aloe vera. With this soap, you don’t have to worry about any allergies. In addition to that, the essential oils that are used make the baby feel very relaxed. So you can get the baby to go to sleep easily after a good bath. Remember to keep the soap wrapped in the cloth it comes in. Since the oils are all cold pressed, they melt quite easily when you keep them in water for a long time. 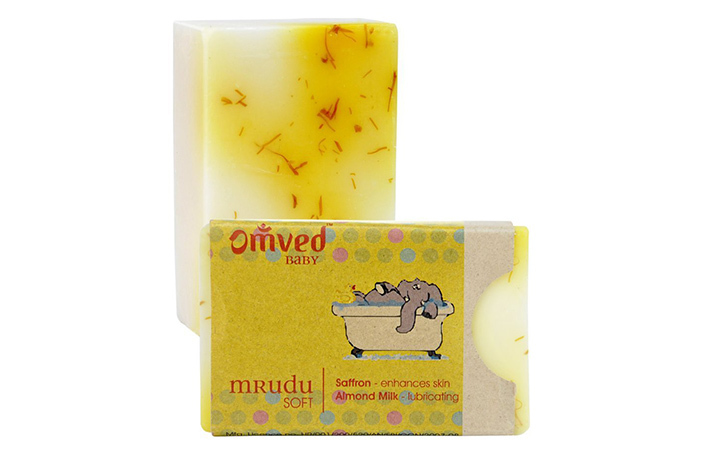 The delicate skin of the baby becomes extremely supple after giving one bath with this soap. 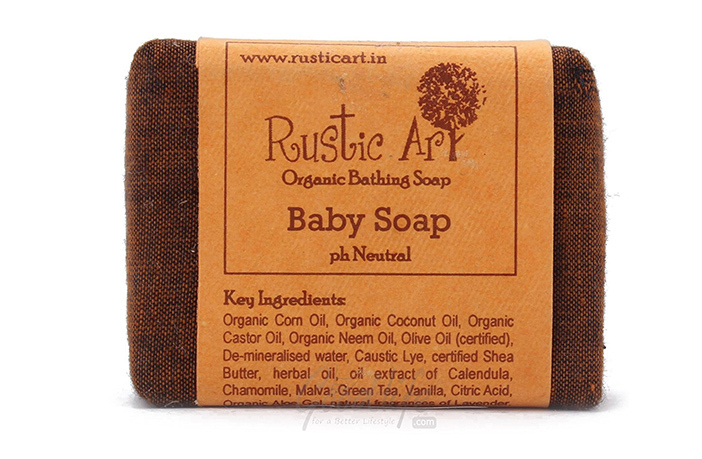 The soap lasts long and the best part is that the natural oils on the baby’s skin are not taken away. What is best about this product is it’s super nourishing ingredients. It contains coconut oil to lock in the moisture, chamomile for gentle fragrance, castor oil and jojoba oil for deep moisturizing. All these lend the baby skin a super luxurious experience that leaves it soft and smooth. Great for use during winters, this organic soap slowly became my favorite. Enriched with the goodness of Kashmiri saffron and almond oil, it lends a gentle nourishment to the baby’s skin. It contains glycerin and castor oil, which not only keep the skin moisturized during the dry months, but also improve skin tone and texture. This soap has a balanced Ph due to the almond milk and is completely chemical and color free. It leaves you with the sense of safety and assurance of using a quality product for your little one. Infact, I also went ahead and tried a few other things in Omved’s range and at the risk of digressing a little I want to mention one product that I simply loved to use occasionally during my baby’s bath time. It is the Omved Shishu Ubtan (priced at INR. 250 per packet). Yes! Imagine an ubtan for the bundle as well and it works wonders on mommy’s skin too. Like all traditional Indian bathing pastes, this one too contains ingredients like haldi and gram flour. But it also goes on to offer the goodness of tulsi, rose petals, and sandalwood. It is extremely soothing for the baby as this is an Ayurvedic recipe that is made from completely organic products. Hope this selection comes in handy when you are about to make a choice for your baby. However, do remember that all babies are different and so are their needs from time to time. Lists can help but at the end of it all it’s a mother’s instinct, her judgment, and the expert advice from your paediatrician that actually take precedence over everything else.